litl house in the neighborhood | We talk about using our litl at home. The first time I used Google docs was last Summer. I feel silly to admit it. A group of us were coordinating our schedule. Each of us needed to fill in availability on a shared spreadsheet. Uh oh. I didn’t even have a gmail account. My daughter logged me in on her account and I opened the file. What do you know? The darn thing worked. Of course the kids have been Google docs for a long time. In our house computer time is at a premium. With all the homework being typed, word processing is big. If you to work on YOUR file stored on YOUR computer—you’re in trouble. But with Google docs that problem goes away. It doesn’t matter where your files are—so we use the first available internet connection. Having litl as the second computer is perfect for hopping onto google docs. What’s worse than your kid lugging a heavy book bag to school? People have been complaining about this forever. Last year I asked Zoë to pick up her older sister’s bag, and she could not carry it— if fact she couldn’t balance just standing. This year her math teacher subscribed to McGraw-Hill’s online textbook service. They use regular textbooks in class, but go online for homework. Zoë doesn’t miss the textbok. The litl works great. I’ll admit it, I was really lazy this morning. As it often happens—from this bliss, my thoughts shifted suddenly to, “Where are the kids?”. It was too quiet. … found safely with their dad, watching Disneyland’s “Electric Light Parade” on YouTube. They were reminiscing about seeing the parade on vacation. So why not watch it on the litl? I wonder if only a person of my generation can appreciate how amazing this is. To watch the parade in our home, on a Sunday morning … just because the kids remembered the great time we had. This is what you see when you try to add a card for facebook.com on our litl. 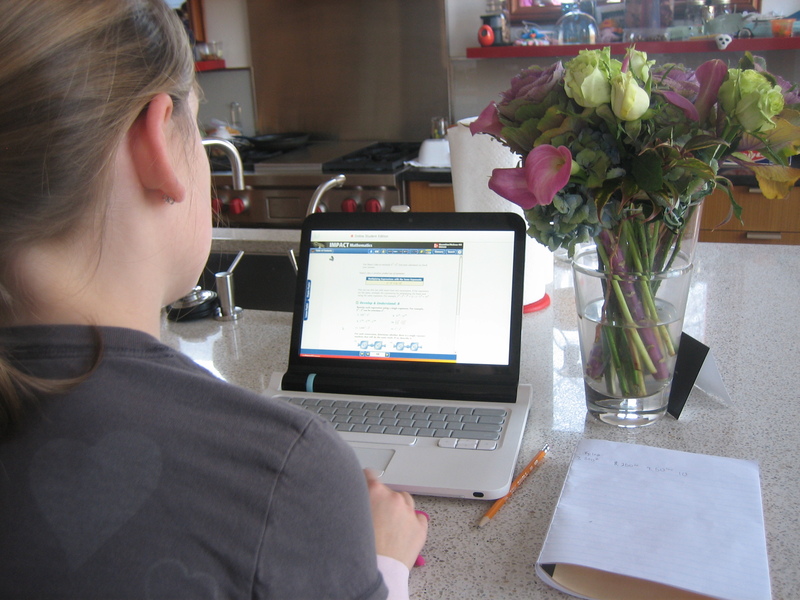 With four kids (from 5 to almost 14), we worry about how they use the internet. Even though we keep computers in public places, it’s impossible to monitor everything. About a year ago we made a family decision to block our kids from Facebook. At first I struggled with the software that came with our laptops (pre-litl). I wasted lots of time with the tech support staff that work with my husband—and we still weren’t satisfied. Then we found OpenDNS, an online service that will do it for free— with advertising. It blocks a website from the entire network, not just a particular computer or user. For setup we read a very useful article by Tom Smith at the Park School. I’ve heard that litl is going to be coming out with an awesome Facebook app. So, sorry kids. You’ll have to wait for now. Zoë is home sick today, so we decided to do some baking. We took the old bananas out of the freezer made a plan for banana bread. Zoe set up the timer in easel mode and had a rest. I think I’ll wake her up when it’s cool. My litl and I went out for a field trip today. Using the litl at home is a pretty seemless experience, but I was curious what it would be like to use the wifi at our local Starbucks. The deal is pretty good. If you buy a Starbucks card you can use wifi services for free. Starbucks restricts you to 2 hours per day, and it expires in 30 days if there is no activity on your card. Without the Starbucks card, AT&T will charge you $3.99 for two hours of wifi use. So with Starbucks card in hand, I opened my litl and got to work. First you have to go to the “Settings” card and select “Wireless”. Click on the “attwifi” network, and wait until the litl says that you are “Connected!”. … But no so fast. Starbucks needs you to do a little work before you’re ready to go. Just open any card and eventually you’ll have an AT&T screen with a link to free Starbucks services. You need to click on this link to get to the registration page. You’ll do a fair amount of work to get your card registered with a user name and password. Now here comes the hard part. I’m not sure exactly what I did, but the phrases, “Where am I?” and “Am I doing the right thing?” were running through my head. After about 5 minutes of this I was prompted to enter and email address and BLAM!–the internet was mine. I checked my email and looked at some websites, especially the Patriots, who have a really big game coming up next Sunday. Next time I go back, I hope it’s a little easier. This morning I didn’t have school because of Veterans Day, but I was up bright and early at 7:00 to be the first to get on the litl. My favourite way to waste time is to watch videos posted by famous ‘YouTubers’. It’s now a profession to make silly videos … wow. Some of the best are; Shane Dawson, davedays, IDEK by des+nate, swiftkaratechop, fred, smosh, and an awesome collaboration of YouTubers called ‘The Station’. First I checked if those people had added anything new and I found a new ‘The Station’ video about zombies… AWESOME, really cool effects. My other absolute favourite thing to do on YouTube is to watch music videos. I was looking up Flyleaf; this truly epic band, when I saw that they had released a new single called ‘Again’. It even had a music video. Very cool, I can’t believe I didn’t see it before. Not only that—they also had a video for one of my favourite songs, ‘Breathe Today’. Clearly YouTube is one of the most fascinating web creations ever, because in around fifteen minutes you watch millions of music videos, keep in touch with pop culture and enjoy hilarious videos, all for free.